Vastal I-Tech is a pioneer software company which was started in 1999 with an aim of providing the best IT Services to all customers. Since then we have rolled out nearly 7000+ website's and 20 software projects for 1000+ clients across 28 countries. We have also sold nearly 1000+ software licenses to nearly 7000+ customers who have benefitted from the quality of code we provide and amount of service we offer to them. Vastal I-Tech was established in 1999 with an aim of providing quality software and internet services to all. Since then we have developed many customized software's for our clients. We have worked on more than 7000+ website's during the past 14 years. Our goal is achieved when we are able to fully satisfy our clients. We are always eager to get a new challenge so that we can improve our skills further and provide you with best possible solutions. Our main goal has always been to create a healthy relation with our clients so that we continue to do business together. Start your social network today! Deals Zone is an advanced group buying script which has all the features needed to run a website like groupon.com or google offers. Deals Zone adds in features from various deals websites and also added in a few features which are unique to the script which enables you to run a successful deals website easily. You can run deals for virtualy unlimited cities, states and countries which will greatly enhance your profitibility and make your website unique and more visible to audience. Start your group buying website today! phpVID is a video sharing software or a video shating script and has all the features that are needed to run a successful video sharing website like youtube.com. The quality of code and the latest web 2.0 technologies have helped our customers to achieve their goals with ease. 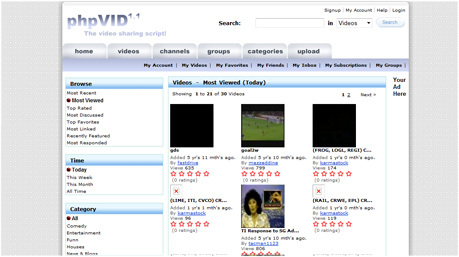 Almost all customers who have purchased phpVID are running a successful video sharing website. The quality of code has helped to generate 3 million video views a month using a "single dedicated server". Start your video sharing website today!